We have travelled extensively in Great Britain but so far, have not yet made the ferry crossing to Ireland. We could not possibly cover all our travels and because travel using your own transport and staying on campsites is not difficult for the majority of disabled in Great Britain, there appears little point in going into detail which is available in many publications. 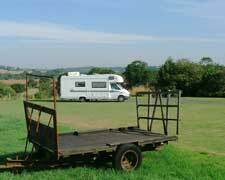 Suffice to say, both the Caravan and Motorhome Club and the Camping and Caravanning Club and many commercial sites provide excellent facilities for the disabled. However, the Clubs' Certificated Locations or Sites, which we have visited, have had no purpose built facilities for the disabled. I think this is to be expected of these small sites which are typically on farms and are limited to 5 outfits at anyone time. As previously stated, there are many sources of site and local information for the disabled visitor but because of the lack of wheelchair accessible public transport and the presence of local hills or rough terrain, which are often not mentioned in these guides, an otherwise excellent location and site can be a nightmare for the wheelchair user. Because of this, and the fact we have been asked for information about sites we have visited where facilities are close at hand, this is the area we will concentrate upon. However, because much of the information is from memory, I strongly urge you to check the latest information if you are thinking of visiting these places. Cardiff, (last visited June 2003) The Cardiff Caravan Park, Pontcanna Fields, Cardiff is located in the heart of Cardiff amongst level public parkland. This commercial site is run by the council and must be one of the best all round sites for the wheelchair user with regards to access to local amenities and attractions. The site is level, with hard standings and a tarmac access road. There is level access to reception and there are separate wheelchair accessible toilet and shower rooms and a hoist is available. The shower is wheel in with hand rails and a fixed head. There is no seating but the on site plastic garden chairs could be used if you so wished. The toilet room has a good wash basin and mirror but the toilet is low although there are folding hand rails on both sides. The site also hosts the local bicycle hire facilities which has bicycles to suit all levels of disability. The River Taff and the Taff trail are close at hand and provide level interesting excursions along the riverside. Also close by is the Glamorgan County Cricket ground, a local Leisure Centre and a pub all of which are within a half a mile and are accessible. Cardiff Castle, Sophia Gardens and the City Centre are about a mile away and all can be reached from the park. A good range of local shops are within a quarter of a mile, access is through a park gate but the area is Victorian and the pavements are rather rough although modern dropped kerbs have been installed. The site is also close to the Millennium Stadium and as a result is popular with visiting fans. Do not expect any space to be available on major sporting weekends. Further afield there are a great many attractions and the rejuvenated Cardiff Bay waterfront is easy to get around once there. 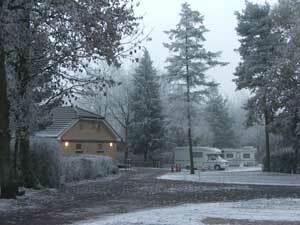 Kingsbury Water Park, (last visited August 2008) The Kingsbury Water Park is a Caravan and Camping Club site but non members are accepted. Sandwiched between the Birmingham and Fazley canal and a Country Park of 15 lakes, the site is level and tarmac access roads lead to hard standing as well as grassy pitches. The site has full facilities with level access to reception and there are disabled toilet facilities and a family room within the reception building. Access to the Country Park is either via a side kissing gate, a bit tight for larger scooters or via the main site entrance. The level park has many all weather surfaced paths and the main facilities area is about a mile away. Here there is a visitors centre, cafe, bicycle hire, which has one bicycle suitable for the carriage of a disable person, play areas and a narrow guage railway. A number of the lakes have fishing platforms for the disabled with car parking facilities close by. Another area, set aside as a nature reserve, has wheelchair accessible hides for bird watchers. A mobility scooter free loan scheme is operated by the park authority but these must be booked at least a day in advance. The canal towpath is also accessible and there is an accessible pub, the Dog and Doublet, alongside the locks a short walk away along the canal towards Birmingham. Skegness, (last visited April 2004) The Caravan Clubs site, Skegness Sands, is located at Winthorpe just outside Skegness adjacent to the beach and close to Butlins Holiday Camp. The site is managed under licence and is co-located with a a well maintained, landscaped static mobile home park whose facilities include a hair dresser and indoor heated swimming pool which are available to tourers. Our stay was limited, so we did not have chance to check disabled access to the pool. There are some small hills on the site but the touring area is mainly level with tarmac access roads leading to large hard standing gravel or grass pitches. Block paved pathways mark the boundaries of the hardstanding pitches and the toilet facilities block houses family rooms as well as a room for disabled visitors. Shops, cafes, pubs and an amusement arcade can all be found within half a mile and the adjacent beach can be accessed from the sea wall although a section of soft sand must be crossed on the ramp down to the beach. The sea wall with its walk and cycle way runs north all the way to Mablethorpe giving the opportunity to access miles of sandy beach. Southwards, towards Skegness the sea wall is not suitable for wheelchairs because it crosses private land owned by the North Shore Golf Club but there is access to the beach beyond the golf club from North Shore Road via Roman Bank, a journey of about 1 mile. It is also possible to travel the 2 miles into Skegness along the pavement along side the Roman Bank road. A high proportion of accessible busses were also observed to run on this route. If it is a fun filled beach holiday you want, for a wheelchair user, this site is hard to beat. If you fancy a quieter more rural spot, northwards up the coast near Mablethorpe is the Caravan Club's site Hawthorn Farm, at Sutton on Sea. (last visited August 2006) This is a level family site with hardstanding and grass pitches inland about 3/4 mile from an excellent stretch of beach. Its a level walk to the Sandilands Promanade sea wall or there is parking for the disabled on top of the sea wall above the free car park and public toilets. A wheelchair accessible bus service, from the first raised platform bus stops I have ever seen in the UK, runs along the A52 coast road a quarter of a mile away. Broadway, (last visited May 2016) The Broadway CC site, is located half a mile away (10 to 15 minute walk) from this pretty Cotswold village. It is a level walk along the roadside pavement to the village where there is an assortment of interesting shops and pubs. The site is on two levels and for anyone with a walking disability it is better to select a pitch on the larger bottom level where there is easier access to the facilities block. Southport, (last visited May 2014) The Southport CC site, is located on the sea front just behind a line of sand dunes which offer some protection from on shore winds. It is also adjacent to Victoria Park and a site side gate provides a convenient entrance into the park which once crossed leads into the center of town which is about three quarters of a mile away from the site. A park and ride is closer just outside the site. The whole area is level and well paved and there should be no problems getting about. Ayr, (last visited September 2005) The Caravan Club's site at Craigie Gardens, is located in parkland and is almost on the banks of the river. The town centre and shopping area is about 3/4 mile away but it is not a difficult walk along the tarmac riverside pathway which is level and takes you down stream to a pedestrian bridge which crosses the river and takes you into the High Street. However, the seafront and esplande is a further level half mile away. The site itself is located in woodland, is level and a tarmac road circles it off which there are level gravel hardstanding pitches. Good disabled facilities are available. York, (last visited February 2014) The Caravan Club's site at Rowntree Park, is located alongside the River Ouse adjacent to the Park itself. The site is level with a tarmac access road leading to gravel hard standing pitches. Reception and facilities are housed in a single raised block near the entrance. This was refrubished in 2012 and a wheelchair lift provides access to all facilities. The standard of the facilities for the disabled is excellent and we could not fault them. The area along the riverside provides level access into York Centre about a mile away but a short hill must be ascended to access the cross river bridges. York itself has many attractions and has many wheelchair accessible busses but some areas of the city, due to the age of the paving, can be rather rough to get about on and the Shambles is, of course, still a cobbled and roughly paved area. Local shops are within half a mile and are accessible through a rear site gate. 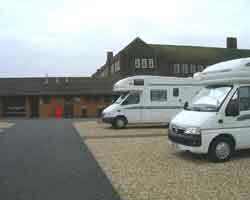 Bristol, (last visited February 2013) The Caravan Clubs site at Baltic Wharf, is located alongside the old dock area. The site is level with a tarmac access road leading to gravel hard standing pitches. The site boasts good wheelchair accessible toilet facilities but there is a single step up for access to reception. The level dockside is accessible from a rear site gate from where you can get to the adjacent pub and the SS Great Britain. On our previous visit 5 years ago the dock side was still under development. This is now complete. Permissive footways, all year round ferries, dockside cafes and the M-Shed Bristol museum have all been established and all are wheelchair accessible. In addition the SS Great Britain museum has been considerably enhanced and is now fully wheelchair accessible. From the SS Great Britain it is also possible to walk the mile and a half into the City Centre along the dockside but it can be a bit of an obstacle course because of the old railway and crane tracks. However, there is a wheelchair accessible cross harbour ferry service from here and if you take this to the other side, it is less of an obstacle course into the city centre. It is also possible to catch the local bus into the city centre from just outside the site. These are now all wheelchair accessible. A local shop is available a short walk outside the site's main gates. Parts of Bristol are extremely hilly. Exmoor, Dulverton(last visited October 2004) The Caravan Club's site at Exmoor House, is located in this small town where there are a few shops for essentials and a good pub. The site is level with a tarmac road circling it, off which there are level gravel hard standing pitches. You do need transport to travel further afield but this is a very good base for touring Exmoor. Keswick, (last visited September 2002) The Caravan and Camping Club site at Keswick, is locate on the edge of Derwent Water in the Lake District. The site is level with a tarmac access road leading to gravel hard standing and grass pitches. There are wheelchair accessible toilet facilities and reception and the information centre are accessible via a long ramp. There is an on site shop but access is up a slight hill. Keswick town centre is about three quarters of a mile away. The route is level at first and then up a slight incline and takes you past the bus station and a supermarket. The town centre is hilly in parts. This is a great base from which to tour the Lake District. Chester, (last visited March 2009) This Caravan Club site at Chester Fairoaks, is located just off the M53 and is open all year. The site is level with tarmac access roads leading to gravel pitches and although located in an Urban area, it is surprising rural. There is level access into reception and the information room and there are good accessible wheelchair toilet facilities although a key is required from reception and the access doors are rather heavy. The wheelchair friendly "The Rake" pub is a short level walk away and a further level walk away along Rake Lane, at the junction with the A5517, is another pub. However Rake Lane does not have a footpath so care is needed when walking along the road. Sainsbury and the Cheshire Fairoaks Designer outlet are also within walking distance of the site and a bus is available from the Designer outlet into Chester. It is not known if the buses from here are wheelchair accessible, we preferred to drive the 4 miles to the Park and Ride at Upton. where they were definitely wheelchair accessible. The Chester Zoo is also at Upton and if you phone in advance you can reserve an electric scooter, free of charge, to make it easier to get around this very large zoo. There are also entrance fee discounts for the disabled. Cirencester, (last visited August 2006) This Caravan Club site at Cirencester Park, is open Easter until January and is located just of the A419 Stroud road. This is a large spacious site adjacent Cirencester Park and about a 20 minute or 1 mile walk from the center of this pretty and interesting town. The site is level/slightly sloping with a tarmac access road leading to gravel hard standing or grass pitches. Reception and the information centre are accessible and there are good wheelchair accessible heated toilet facilities in both toilet blocks, a Radar key is required. Wheelchair access to the town, where there are all facilities and much of interest, is down hill via the cycle way running along side the A419. There is a route of similar distance through the park but a kissing gate prevents wheelchair users from its use. Park access for a wheelchair user is off the A419. The town is level and wheelchair friendly and the Corinium Museum and the church are not to be missed. The Roman amphitheatre was disappointing and is not wheelchair accessible. 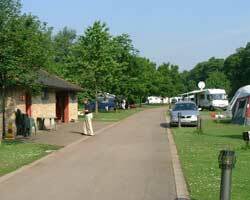 Peterborough, (last visited June 2011) The Caravan Club Site at Ferry Meadows, is about 3 miles away from the City Centre. 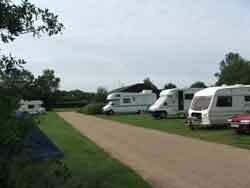 The site is level with a tarmac access road and gravel hard standing pitches available. There are good wheelchair accessible toilet facilities and reception is accessible. Although some way from the City Centre, the site is set in the middle of parkland with many wheelchair accessible paths and cycleways and the whole area is fairly level. There are cafes close by in the park and a pub is a short level walk away. Peterborough being a modern City should present little difficulty to the wheelchair user. London, (last visited August 1997) The Caravan Club site at Abbey Wood, South East of the City has been considerable modernised since we were last there and I expect the site to now have excellent facilities for the disabled but please do check. It's plus point and object of our visit was the good wheelchair access it offers for getting into central London. It takes but a few minutes to walk about 600yds past local shops, slightly down hill to the Abbey Wood railway station where all platforms are wheelchair friendly. Trains to either London Bridge or Charing Cross stations have wide doors and both stations are wheelchair friendly. From Charing Cross Station it is but a short stroll along the Strand to most of Londons' theatres. Cromer, (last visited April 2012) The Caravan Club site at Seacroft, is about 3/4 mile away from the town centre which is little more than a 20 minute stroll away along the sea front. It eeasilly accessible by scooter or wheelchair or there is a bus stop just outside the site from where you can travel into Cromer or further afield.